St. Joseph’s Charlie Brown Jr. scored 20 points on Friday against Old Dominion. Had this game with Old Dominion been on a neutral court, it would have been one of those 50-50 games that St. Joseph's coach Phil Martelli told his fellow Atlantic 10 coaches that the league has to win to improve everyone's chances come NCAA Tournament selection time. Hagan Arena, however, is not a neutral court. It's the Hawks' home and that changed the percentage to a supposed win. In his first game back after sitting out last season with an injury, Charlie Brown, Jr. scored 20 points to lead the Hawks to a 79-64 season-opening win. St. Joe's also got 17 points and 14 rebounds from Pierfrancesco Oliva, plus 14 points each from Lamarr Kimble and freshman Jared Bynum. Leading 42-39 at the half, the Hawks went on a 12-2 run to go up 54-41 with 13 minutes, 49 seconds remaining. 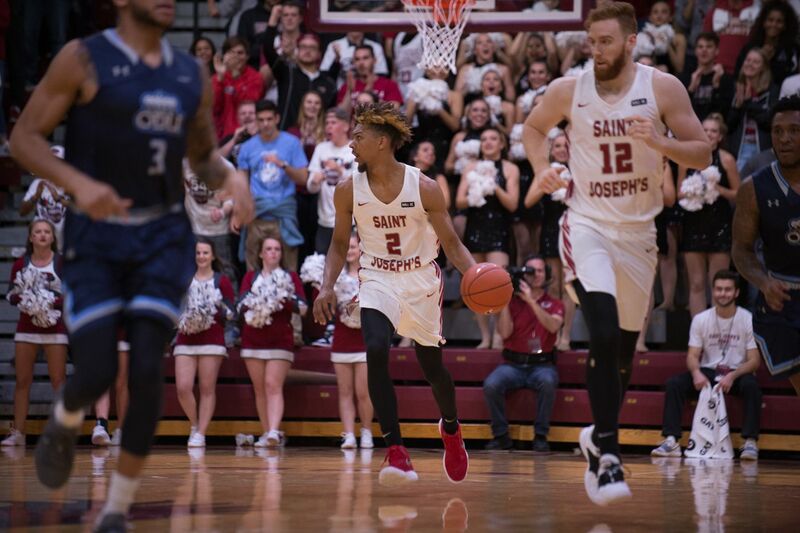 That set up an immediate test of something St. Joe's struggled with much of last season – closing out when in control of a game. After holding a double-digit lead, St. Joe's saw the score cut to 61-53 with 6:50 left. A year ago, the Hawks had a propensity to shrink and let things continue downhill. ODU (1-1) got a free throw, but then Bynum drove to the rim and kicked a pass out to Brown on the right wing. Brown buried a trey to make it 64-54. The next time the Hawks had the ball, Bynum made a three-pointer. Then came a moment that might well define how St. Joe's will perform this season. Old Dominion guard Marquis Godwin threw down a vicious dunk that had the crowd on Hawk Hill telling the players to give it right back to them. But Godwin's score only pulled Old Dominion within 11 points (67-56) with just under 5 ½ minutes left. The Hawks realized that they were in control and that smart basketball was the way to victory over a moment of payback machismo. St. Joe's closed with a 12-8 run to start the season the right way. "I like this group," Martelli said. "They are really mature. We've talked about things like that. "This is not a team that can make multiple mistakes. We took some quick threes, but we also got back on defense. "Even though it is relatively young, this is a team that has played a lot of minutes. I wasn't surprised. Now, had it snowballed, I'd have kicked myself for not calling a timeout."